Ocracoke carvers David O'Neal and Scotty Robinson at the 2018 festival. 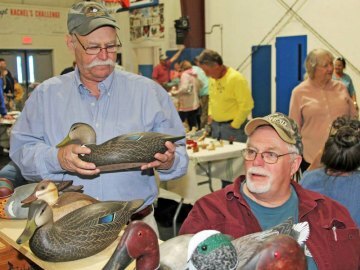 Decoy carvers and aficionados will again descend on Ocracoke for the Second annual Ocracoke Waterfowl Festival from 9 a.m. to 5 p.m. Saturday, April 20, in the Ocracoke School Gym, 120 School Rd. The event is presented by the non-profit Ocracoke Island Decoy Carvers Guild, which formed in early 2018 to preserve this art form in Ocracoke history. Islander Dan Robinson of Ocracoke will be this year’s featured carver. Dan has been a carver for more than 40 years. He will be joined by his sons Dale and Scotty, who follow in their father’s footsteps. Carvers and collectors from along the eastern seaboard will pack the gym with decoy carvings of redheads, ruddy ducks, blue bills, swans, geese, shorebirds and more, along with artwork and artifacts related to North Carolina’s rich waterfowl tradition. As at last year’s event, at which about 600 attended, there will be plenty of food, kids decoy painting sessions, raffles and a decoy head-carving contest. The Clam Chowder Cook-off, a fundraiser for Ocracoke Child Care, will be part of the food offerings this year, along with fish sandwiches, desserts and more. Souvenir T-shirts, hats and a poster will also be on sale. Festival parking will be at the National Park Service parking lot at Pilot Town Road and Irvin Garrish Hwy. near the ferry docks in the village. A free tram service will be running from the parking lot to the festival and back all day. For more information about the festival, visit the Facebook page: Ocracoke Island Decoy Carvers Guild, send email: Decoysjohn@gmail.com, or call 509-930-4988.